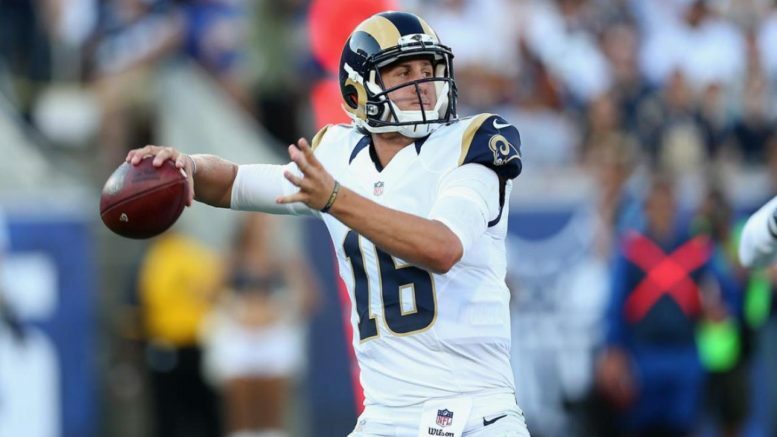 Jared Goff gets his first NFL start for the Rams against the Dolphins. Losers of four straight, it’s crunch time for the Vikings. The Cardinals are one of the league’s biggest disappointments, even though at 4-4-1 they’re very much alive in the playoff chase. Still, the Vikings should be able to muster up just enough defense to get by in this one. Pick: Vikings. What a story the Cowboys have been, winning eight straight with a rookie quarterback. In to town come the Ravens, who have regained their stride after a four-game losing streak. The Ravens should be able to keep it close with their defense, even if the Cowboys will be too much in the end. Baltimore is a perfect 4-0 lifetime against the Cowboys, but this is its first visit to the Cowboys’ “new” digs after effectively shutting down Texas Stadium with a critical Week 16 win in 2008. Pick: Ravens. The Bills need a win badly against another one of the league’s biggest disappointments in the Bengals. But Buffalo is tricky, winning when you don’t think it can. After a bye, the Bills should put up a good fight in the Jungle. Pick: Bills. The Bears are winless on the road, and haven’t covered away from Soldier Field, either. This team stinks, and the Giants have an opportunity to pick up a gimme and keep pace with the rest of the NFC East. After grinding out a win Monday night against Cincy, look for the Giants to breathe a little easier in this one. Pick: Giants. How can the Lions be in first place? Never look a gift horse in the mouth, and that’s exactly what is coming to town in the lowly Jaguars. It might not be a gimme, but the Lions should get to 6-4 against a team that is long overdue to fire its head coach. Pick: Lions. The Browns barely qualify as an NFL team, but the Steelers are so desperate for a win after losing four straight for the first time since 2013 that they couldn’t care less. Pittsburgh found its offensive rhythm last week despite defensive shortcomings, but it should put it altogether against the bad football joke known as the Browns. Pick: Steelers. Amazingly, Tampa Bay is 3-1 on the road, and at 4-5 is still alive in the tepid NFC South. The Chiefs are on a serious regular-season roll, winners of 18 of their last 20 regular-season games. Kansas City should emerge victorious, but the Chiefs don’t really blow people out, and all the pressure is on them as they are stuck in the middle of a tight AFC West race. Pick: Buccaneers. It’s hard to believe the Titans are 5-5, but the Colts may have proved something to themselves by winning in Green Bay two weeks ago. They have had a hex on the Titans, winning 10 straight while Andrew Luck is also unbeaten lifetime against Tennessee. Look for that to continue on Sunday. Pick: Colts. The Dolphins are red-hot and in search of their first five-game winning streak since 2008, when they won the AFC East behind Chad Pennington. The Rams are a mess and have turned to rookie Jared Goff, who will be making his first NFL start. That usually doesn’t bode well for struggling teams, so look for Los Angeles’ offensive struggles to continue and Miami to put up just enough points to get by. Pick: Dolphins. As much as I’m tempted to say the 49ers will put together an amazing, spirited, overachieving effort and only lose by 12 points, we’re talking about the Patriots coming off of a loss. This team feels slighted by the powers that be whenever it loses one measly football game, and finds a way to bend a new rule or unveil a new formation you’ve never seen to shove it into the next opponent’s face. Tom Brady will be making his first-ever start in his hometown of San Francisco, narrowly missing playing there last year in Super Bowl 50. The Golden Boy will make the most of this one and conjure up memories of his idol, Joe Montana. Pick: Patriots. The Seahawks might need a quarter or two to get rolling against the Eagles coming off a Super Bowl win — er, regular-season win that felt like a Super Bowl win against the hated Patriots. Still, expect this Seahawks team to keep picking up steam against an Eagles squad that might be running out of it despite a strong rookie year from QB Carson Wentz. Pick: Seahawks. A year ago, the Redskins were a trendy pick to upset the Packers in the wild card round, and got off to a fast start before getting steamrolled. It’s do-or-die for the Packers, who need this one terribly to stay alive. The Redskins are playing solid football, but it’s hard to imagine Aaron Rodgers and Co. throwing in yet another clunker, especially on national television. Pick: Packers. Be the first to comment on "NFL Week 11 Picks: I Need TNF Redemption"